CenturyLink Field and Sounders FC adhere to the NFL’s Clear Bag Policy. Walker’s Lockers is present at every game to make it easy for fans to securely check their items and enjoy the game worry-free. 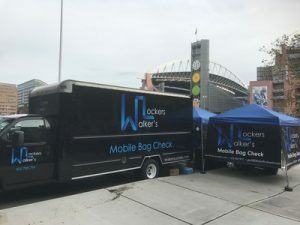 Walker’s Lockers is the ONLY OFFICIAL AND APPROVED Bag Check Service at CenturyLink Field. We carry Liability and Bailee’s insurance to protect your property while it is in our possession. You will find our truck in the northwest corner of the North Parking Lot at CenturyLink Field. Be sure to look for the Blue and Black Walker’s Lockers truck, banners, and logos to ensure you are checking your items with the right partner.